It’s never just a cough. Robitussin Honey maximum strength formula delivers fast, effective cough relief. Dextromethorphan HBr cough suppressant helps reduce the urge to cough. 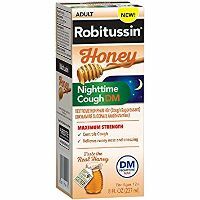 Robitussin Honey Nighttime Cough Congestion DM is formulated for adults and children ages 12 and over.